Description: Convenient simple reminder with backup and password protection. Description: Say bye to the conventional Windows tray clocks. Designed as a more informative substitution for a standard tray clock in Windows. Not only does it display time in the hour-and-minute fashion, the clock also displays date, system uptime, time for any time zone, current weather conditions, forecasts and alarm clock. Over 130 skins are included in the distribution. Active Alarm Clock also an atomic-time synchronizer. Description: Wake up, remember weekly appointments, never miss a meeting with EIPC's amazing Alarm Clock 4 Free. Customize each alarm, by marking the weekdays and choosing your favorite song, rhythm or alarm sound for each appointment. You can also specify the snooze time that suits you.With its easy to use interface and its powerful features, EIPC's Alarm Clock 4 Free is a valuable addition to your desktop. 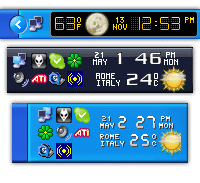 Description: AlfaClock is a handy taskbar clock with powerful capabilities and stylish design. It comes with Atomic clock Synchronization feature, alarm, ISO8601 compliant calendar, and date/time announcer. AlfaClock takes very little system resources and is fully compatible with Windows 9x/ME/NT/2000/XP. 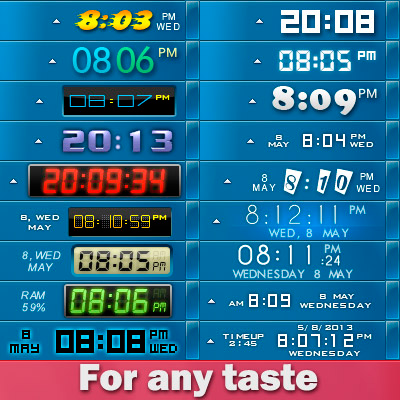 Description: AlfaClock enhances your tray clock functionality. Of course, you can customize the look of the program, adjusting fonts, colors, backgrounds and more. But, the main goal of this program is to extend your tray clock functionality. It can speak the time, start Windows applications at a specified time, indicate processor and memory loads and more. Give this really useful program a try. Description: Analogue Vista Clock is an outstanding quality alarm clock for your desktop. It comes with six awesome, real time rendered vista-style skins, and you can download more. You can use one of its internal alarm sounds or configure it to play any external sound file. It supports gradual wake feature. Furthermore you can specify which days of the week alarm will be played and the clock will wake up the computer if it's hibernated or in standby mode! Description: Software that will help you find the best deals on the net for Art Deco Antiques, Art Deco Furniture, Art Deco Lighting, Art Deco lamps, Art Deco clocks, Art Deco tables, Art Deco Mirrors and Art Deco Pottery. Description: This helps you to find the best deals on the web for art deco antiques, art deco clocks, art deco mirros and other art deco furniture. Description: Alert yourself about important events with different alarms and replace your computer tray clock using different skins. Computer Alarm Clock that will play any MP3 file. It can also run a program, log off, reboot, shut down, or turn off. Atomic Alarm Clock is also an atomic-time synchronizer and advanced replacement for Windows tray clock. Over 130 skins are included in the distribution. It is supported by Longhorn clock style.